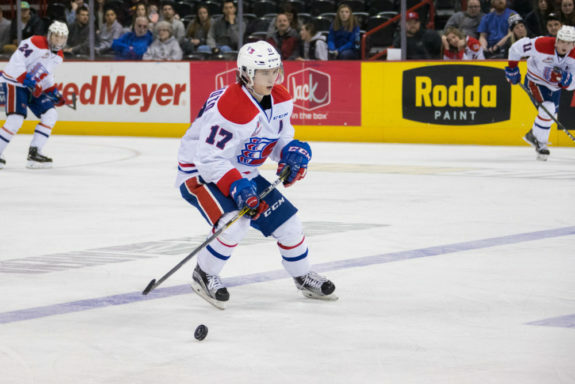 Since coming back from the 2018 World Junior Championships, Edmonton Oilers prospect Kailer Yamamoto has absolutely torn apart the WHL. The 22nd overall pick in the 2017 NHL Draft has had an impressive nine multi-point games since the WJC. He was riding an 11-game point streak that went back to Dec. 9 that was finally snapped the other night against the Kelowna Rockets. Still, the 19-year-old has put up 30 points in just 12 games since the WJC. Yamamoto now has 12 goals and 42 points in 25 games with the Spokane Chiefs. That’s an impressive 1.68 points-per-game, which is the highest of any Oilers prospect in the entire CHL. Kirill Maksimov (1.26) and Tyler Benson (1.21) are the next closest to him, but Yamamoto has been out-of-this-world good. In three of his last five games, the youngster has put up four or more points. On Jan. 28, he recorded four points in a win against the Everett Silvertips and recorded five points in two of his next four games against the Kootenay Ice and Tri-City Americans. Spokane has reaped the rewards of Yamamoto’s dominance as well – the Chiefs are 9-1-2 since Yamamoto returned from the WJC and are 8-0-2 in their last ten games. Just How Good Has Kailer Yamamoto Been? Yamamoto might be far off from finishing as one of the WHL’s top scorers this season, but that doesn’t tell the story. If you calculate his points per game with the same number of games as the WHL’s leading scorer, Yamamoto would be a top-five scorer in the league. Glenn Gawdin currently leads the WHL with 104 points in 56 games. Compared to Oiler prospects like Maksimov (58 points in 46 games), and Benson (51 points in 42 games), Yamamoto would have 91 points right now in Spokane’s 54 games played. He’s been scoring at an incredible pace. You can only imagine the type of bump in production a guy like Jaret Anderson-Dolan would have if he had his linemate all season. For comparison’s sake, think back to when the Oilers sent Leon Draisaitl back to junior midway through the 2014-15 season. Draisaitl joined the Kelowna Rockets, scored 53 points in 32 games, and ended up being named the Most Valuable Player at the 2015 Mastercard Memorial Cup. Right now, Yamamoto has a higher points-per-game average than Draisaitl’s 1.66, so that gives you an idea how dominant he’s been since going back to junior. Yamamoto led the Chiefs in scoring in back-to-back years. This season will be the first season he didn’t – that honor will likely go to Anderson-Dolan who went 41st overall to the Los Angeles Kings last summer. But if Yamamoto played a full year, he would’ve been the first player in Chiefs history to lead the team in scoring in three consecutive seasons. When Yamamoto made his WHL debut, he had one of the best seasons as a 16-year-old in franchise history. He was second in goals, assists, and ranked third for the single-season record for most points by a 16-year-old for the Chiefs. Yamamoto has now moved into the franchise’s top five for all-time assists with 173. If he records another 13 assists to finish the season he can tie Mitch Wahl for fourth all-time. The other night, Yamamoto recorded his 12th goal of the season, which moved him into 11th all-time in Chiefs scoring with 269 points. When he scores his next point, he’ll officially move into the top ten and tie Ryan Duthie (270). If Yamamoto keeps up his current pace of 1.69 points-per-game, he could pick up another 30 points in the remaining 18 games. That could put him in reach of 300 points all-time as a Chief, and fourth among the all-time scorers in Spokane’s history. Be on the lookout as the WHL playoffs approach, because Yamamoto and the Chiefs could do some significant damage come playoff time. Can they cause an upset or two? Who knows. But right now, they’re one of the WHL’s hottest teams, and a lot of that is thanks to Yamamoto tearing the league apart offensively since returning from the WJC. Oiler fans – are you excited? Let me know your thoughts in the comments below.